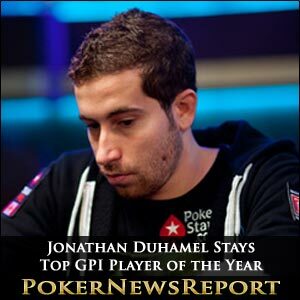 French-Canadian poker star Jonathan Duhamel has retained his place atop the Global Poker Index (GPI) Player of the Year leaderboard as the top six places remained static this week. 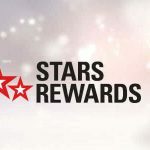 The Team PokerStars Pro has 595.68 points to sit an impressive 252.81 ahead of second-placed fellow Canadian and former Team Full Tilt Poker Pro Erik Cajelais (342.87), while places three to six are again filled by Bruno ‘Kool Shen’ Lopes (337.27), Florida’s Noah Schwartz (326.05), Faraz Jaka (308.34), of San Jose, and yet another Canuck in Montreal’s Sam Chartier (305.79). Duhamel – the World Series of Poker (WSOP) main event champion in 2010 – enjoyed a fantastic January with four top five finishes at the PokerStars Caribbean Adventure (PCA) on Paradise Island, including victory in the $5,000 buy-in No-Limit Hold’em Eight-Max event for $239,830. In total, the 24-year-old earned $1,205,970 from his time at the Atlantis Resort & Casino tables, with his biggest cash – for $634,550 – actually coming in the $25,000 No-Limit Hold’em Eight-Max High Roller event as runner-up to Russian Leonid Bilokur. on March 9, Duhamel is continuing his fantastic start to 2012. While the one-time WSOP bracelet winner from Quebec leads the stationary top six on the rankings system that honours the player with the best set of results throughout a calendar year, Australian Oliver Speidel has jumped four places into seventh spot on 300.53 points. 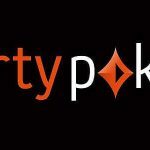 This year’s Aussie Millions main event champion – who collected $1,647,158 for that success in Melbourne at the end of January – also took sixth place at last weekend’s AUD$2,000 buy-in No-Limit Hold’em Australia & New Zealand Poker Tour (ANZPT) main event in Sydney’s Star City Casino for $41,262. Pittsburgh’s Jason Koon drops once place into eighth on 284.24 points, while Ruben Visser (258.03), of the Netherlands, and Englishman Stephen Chidwick (248.77) also fall one spot each into ninth and 10th respectively. Finnish star Juha Helppi is the man to drop out of the top 10 into 11th place on 247.27 points, while another notable mover is Argentinian Team PokerStars Pro Leo Fernandez, who climbed 184 spots into 34th on 195.40. The Buenos Aires pro recently won the R$9,600 buy-in No-Limit Hold’em High Roller event of the Latin American Poker Tour (LAPT) during the Grand Final at Sao Paulo’s WTC Hotel in Brazil for $71,717. Other players enjoying significant upwards movement inside the top 100 were Bulgarian Rumen Nanev (up 70 places to 46th on 182.23 points), Tallahassee’s John Dolan (up 108 to 68th on 163.64) and Mexican Jose Manuel Nadal (up 259 to 71st on 163.19). Check out our GPI page for more information on the Global Poker Index.